UPDATE 12:05 pm ET: The Wrap is now reporting that Deathstroke is in fact the primary villain of the solo Batman movie. While we’re still unsure if this is test footage for that film or if Deathstroke may also be making a cameo appearance in Justice League, at least we now know where to expect Deathstroke’s arrival in the DCEU. Consider this a sequel of sorts to all that nonsense about Henry Cavill and the black superman suit, but hey—this time at least Ben Affleck brought us what appears to be tangible evidence as to Deathstroke’s arrival in the DC Extended Universe. Affleck has just posted, out of nowhere, footage to his official social media accounts of what looks like filming for a scene involving the legendary DC Comics assassin (and star of his own brand new comic!) 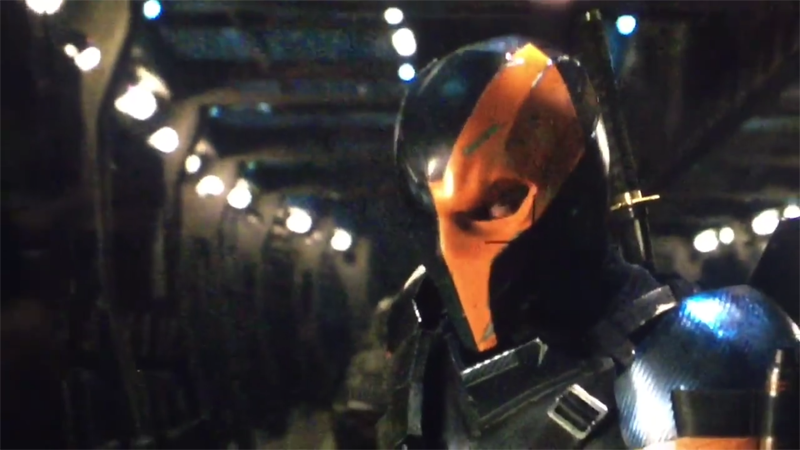 Deathstroke walking down some sort massive aircraft bay. We have absolutely no idea where this is from; Justice League would be the most obvious answer, as it’s the only DC movie we know of currently filming. Plus, Deathstroke is seemingly in the hangar of the Flying Fox, the large aircraft Batman uses as the Justice League’s base of operations in Justice League. We also have no idea if it’s real, but we’re once again presuming it is, otherwise this is the craziest and most elaborate red herring we’ve seen in a long while. I mean, not just the costume but the whole ‘framing it as filming’ thing, too. So Ben Affleck maybe just revealed the arrival of a big DC Comics character to the movieverse out of nowhere by posting off-camera filming footage to Twitter. What a world we live in.